Swine Flu Pandemic or Soon-to-Be-Forgotten News Item? The Planetary Patterns Give Insight. Four days ago, the alarm was raised regarding a swine flu outbreak in Mexico City, where more than 100 people were reported dead. The WHO (World Health Organization) has said that this flu has “pandemic potential”. The first outbreak has recently been identified as probably in La Gloria, Veracruz, in eastern Mexico. This village is 12 miles from an American-owned industrial pig production facility, although they claim no involvement in the illness. However, the national health authority suspects that waste from the factory could be the source. In 2005, I did some research on a subject that had long fascinated me, the 1918 “Spanish” Influenza. Based on that research, I wrote an article, “Planetary Miasms”, exploring the planetary patterns of the time. I also looked at other epidemics that were classified as pandemics and speculated about future possible times when such could occur again. In that article, I pinpointed one time when the patterns, the “miasms of planets”, were similar enough to those of 1918, and that was in 2009-10. Typically, at least one new mutation of the H2N3 flu type develops every year. However, from time to time a flu virus is born that is more virulent. These virus are of the H1N1 variety, a form of swine flu. 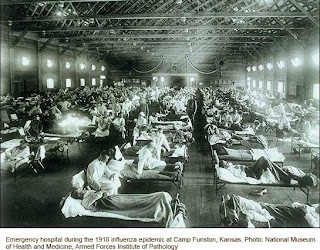 The 1918 flu pandemic was an H1N1 strain. Its outbreak lasted from late 1917 through April 1919, or about 18 months. There were two outbreaks, the first mild and the second deadly. Any virus can take several months to a year to catch hold in a human population. Large gatherings, cold weather, other factors reducing the resilience of the immune system such as stress — all play a role. What Can We See in the Planets? In 1918, the most notable patterns involved layered interactions between Saturn, Uranus, and Neptune. Jupiter and Pluto were also “near-missing” each other, but not interacting with the other three heavy planets. In the other two epidemics that were labeled pandemics,(based on the number of cases) in 1957 and 1968, none had comparable numbers of cases or deaths. The planetary patterns were not as intense either. We have two patterns occurring right now, and both are powerful. Saturn and Uranus are opposing each other, the same mathematical contact they made in 1917-19. In fact, the entire outbreak was timed pretty exactly to the time that these two planets were interacting. Saturn and Uranus this time around have been interacting since Fall 2008 and will continue to face off until July 2010. The other pattern occurring right now involves Jupiter, Chiron, and Neptune, which first started coming together in February and will be very strong in May, August, and November. These planets appear to be involved in timing the outbreaks, as the first one happened in February. However, the recent spread of the disease occurred when Saturn and Uranus were being contacted by Mars, which occurred between April 4 and 14. If it is clear that these planetary patterns are implicated in the disease process, it is likely that the new H1N1 strain developed last fall at the first Saturn-Uranus contact, but that it took its usual underground route into the human population, emerging in February as these planets made their second connection. Following this timing, there is an increased chance of a virulent outbreak in the days and weeks around September 15, their next time to link up. 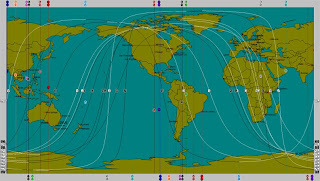 They have two more connections after that, and if the outbreak has not been contained by then, we may see a resurgence around those times, April 26 and July 21, 2010. Jupiter, Chiron, and Neptune do not appear at this time to be implicated in the timing and virulence of this swine flu outbreak, but they could be involved in exacerbating the circumstances under which the virus is spread. More likely, however, is that they indicate a human response, such as a curtailment in travel (Mercury retrograde square this expansive combination), as we head into a month where they are heavily featured. For all these reasons, my conclusion is that the Mexican swine flu will be a problem but not as big a problem as the biggest of them all, the influenza of 1918. The world economy and social interaction will be affected by limitations placed on human movement, but the flu will be relatively contained. Robert Blaschke has noted astutely that Mexico’s chart has a high level of Pluto activity in it, and that “viruses are ruled by Pluto”. (TMA Blog) I would not make so blunt a statement, as the many facets of disease processes involve many planetary energies. I relate viruses primarily to Neptune because of their fluid, unseen, and insidious nature; they do not always involve death or deep transformation, but where they are deadly Pluto is unquestionably a factor. Uranus gives us the energy of mutation, and Saturn the limitations placed on human populations, both in terms of population growth and population movement, as well as human failures. Jupiter spreads whatever it touches — perhaps here it is spreading awareness of what happens in the world’s disadvantaged populations when one of the many possible health threats to them materializes. As it is tied to wounded healer Chiron and virus-associated Neptune, the potential for spreading through poor public health management is considerable. However, if this is a time that we respond as a species to the need for improved health care for all people, the planets are bringing a great human wound to the surface for humanity to work on together. (See my May forecast for more on the great human wound.) This situation underscores the fact that we all sink or swim together. When we support those in need around the world, we support ourselves. Maybe it’s because I met the guy, but I’ve been quite fascinated by Al Franken’s long journey to the US senate. When I met him, I asked what his birth time was, and he gave it to me (within a half-hour time frame). On the basis of that chart, data from memory, we might be able to see when he’ll take his seat as senator. When I was trying to prognosticate as to how many senate seats the Democrats would win last fall, I kept looking at Minnesota’s numbers, and they were — crazy! Double digit variations from one source to the next, with a third-party spoiler. (Minnesota seems to come close to having multi-party elections.) 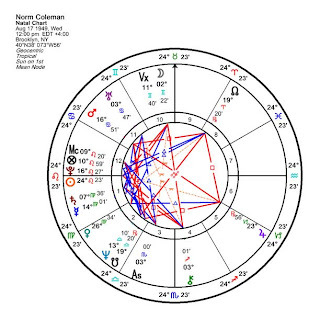 So, I looked at both Franken’s and Republican incumbent Norm Coleman’s charts (Coleman’s untimed chart is cast for noon. ), and I couldn’t see a clear winner: Both charts looked insufficiently strong on January 5, the day the oath of office was administered. I predicted (privately) that Franken would win, but it would be a long, drawn out process to decide who would take the seat. I have not been disappointed. It has turned into the circus I knew it could be unless Coleman decided to grow fairness genes over Hanukkah. On April 13, a panel of three state court judges declared Al Franken the winner, but Norm Coleman has appealed the decision to the Minnesota Supreme Court. There, it is expected that three judges will need to recuse themselves, leaving four judges to rule on the case. Mercury Retrograde Could Play a Role. When will Senator Franken be seated in the Senate? A look at his chart can give us clues. 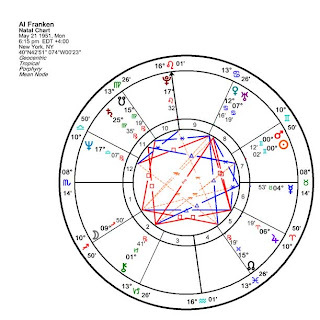 What I find interesting about Franken’s chart is the fact that he has Sun and Mars conjunct at 0̊ Gemini (no wonder he has been a comedian). Mercury is set to go over these points three times when it turns retrograde on May 6 just past these planets (at 1̊45' Gemini), effectively standing still on Mr. Franken’s Sun-Mars. This does not sound like swift movement into his designated seat. However, Mercury has been known to shake things loose. Mercury does not tangle with anyother of his planets. In contrast, it will square Coleman’s Sun in Leo three times. Sounds like bad news for Mr. Coleman! It is possible that, during the three weeks of Mercury’s retrograde, the race will be below the radar. However, if there is news, it will be on the days that Mercury contacts Franken’s Sun-Mars, which are April 30 – May 2, May 12-13, and June 14. Any bets on June 14? Although there are many factors to consider, and divining a date for such an event is a bit like guessing when a baby will be born, June 14 or thereabouts is a good possible date for when the Minnesota Supreme Court will make a decision, and it will be in his favor. It is possible that a decision will come on one of the other dates, and if so, the time table moves up, but the dates still apply in some fashion. Governor Tim Pawlenty could ostensibly decide not to sign the document authorizing Franken to take the seat, especially if, as expected, Coleman appeals to the US Supreme Court. However, if he does so, he cannot do so on the same basis as he is currently using. He will have to claim that he was denied equal representation. This is a substantially different argument that would result in the election being thrown out. Widely held speculation suggests that the Supremes will refuse to hear the case, but this will take time. Of course, the name of the game (well, there are two of them) is: One, win by any means necessary; two, delay the seating of Senator Franken as long as possible to weaken the Democrats in the Senate and to shame Al Franken as much as possible. A little on the backstory here. In 2002, just before the election, the incumbent Senator Paul Wellstone was killed in a plane crash while campaigning in his state. His opponent was Norm Coleman, who was losing badly to this popular senator. Coleman, the Republican Party at some level, and the right wing media conspired to defame the Democrats before, during, and after Wellstone’s funeral, in a shameful example of human behavior. Coleman won against Democratic replacement candidate Walter Mondale and held the seat for one term. Eclipses Could Play a Role. If the senate seat remains in limbo past this time, the eclipses will come into play. A Lunar Eclipse on July 7 picks up Franken’s Venus/Neptune square, plus Coleman’s Mars/Neptune square, with equal intensity. The Solar Eclipse on July 21 triggers neither chart, but a rare second Lunar Eclipse on August 5 falls near enough to Al Franken’s MC/IC to suggest that he is likely to take or be in office at this time. This is a rough estimate, and not a definitive analysis; let’s see what unfolds. Venus is Going Direct . . .What’s Next? So what happened? The stock market went up, and many are proclaiming that the end of the recession is in sight. Is it really? Venus says, “Yes, yes, yes”, but the other planets say, “No, no, no.” Saturn-Uranus were coming together as the crash began to take shape, and they were in exact focus as it occurred. They will continue to interact in a similar fashion through July 2010. The whole economic transformation began when Pluto first entered Capricorn, in January 2008, with the market manipulation caused by French trader Jerome Kerviel when he engaged in fraudulent futures trading in 2007-08. This occurred on January 21-24, and Pluto entered Capricorn on January 25, 2008. Pluto will be in Capricorn for 15 more years. This tells us it’s not over, but it is true that it is over in the form it has taken on the surface, the form that Venus represents. We may be able to recover now — but the forces that caused the crash and subsequent downturn are still able to wreak havoc on the system. To understand why I say that, we have to dig a little deeper. We have to look at the backstory on what brought on the instability in the banks and what made these titans fall. It wasn’t your subprime mortgage. Naked Short-Selling Is at the Core. It was naked short-selling, where a trader creates phantom shares for a company that cause its market value to crash. To learn more about what happened, watch this video by Judd Bagley, “Hedge Funds and the Global Economic Meltdown”. Although there undeniably were conditions that set us up for a fall of some grandeur sooner or later (mortgage-backed securities, the housing bubble, fraudulent loan practices involving subprime mortgages, falsified credit ratings), the crash would not have been so deep nor the credit tsunami so catastrophic without the criminal behavior of several Lord-of-the-Universe hedge fund managers who to date have been untouched and appear untouchable. After the shock on January 24, the first hit from inside the US was landed on Bear Stearns on March 11, 2008, although the activities that led to this blow surely started before then. The planets that were activated then were Uranus and Mars-Pluto (the third contact of Mars with Pluto after its retrograde). This turned $1.7m into $270m in one week. Bear Stearns was rescued by the Federal Reserve and JP Morgan Chase (based on $29bn in taxpayer dollars to guarantee the merger) after employees lost more than $5bn on company holdings. Eight thousand lost their jobs. So, Uranus and Pluto, with a smattering of Mars, are the primary timers of events. Saturn joined their party by mid-summer, when it moved into range of Uranus, thickening the stew. As Pluto went retrograde a week later, the Senate banking committee met in early April to figure out what happened to Bear. When they questioned SEC Chair Chris Cox, he sounded unconvincing as he made a commitment to investigate who did what and prosecute them. And he was all too revealing of his future actions: Nothing was done. The second hit was against Lehman Brothers, starting June 27, in which criminal naked short-selling brought the price of Lehman Brothers down by 40% over two weeks. It was Uranus again, this time at its retrograde station (stationary retrograde). The SEC belatedly took action on July 15, choosing to require additional regulatory oversight starting July 21 over naked short-selling of the stocks of 19 large financial institutions like Lehman Brothers and Fannie Mae. This order was allowed to lapse mid-August. Evidently the culprit(s) lay low for a while, and then on September 9 they struck again. After 90 million failed trades hit the market that week and the Fed decided not to bail them out, Lehman Brothers declared bankruptcy on September 15. For the two days following, traders leapt on Lehman like vultures, eaking every last cent out of it. By the 18th, this 158-year-old company had vanished. This is when the global economy crashed. The Sun-Uranus opposition was on September 12, and the first Saturn-Uranus opposition was on November 4. According to Judd Bagley, the bad guy(s) can be found among a handful of short-selling hedge fund managers, yet the SEC has yet to investigate them. Since then, we have been in transition mode — the election, the new administration getting staffed and finding its feet, economic ups and (mostly) downs. The market psychology was confused, and this was certainly just as true during the past Venus retrograde. What was different is that there were a few indicators that leveled off, and this led to gains in the stock market. If there are no further giant hits to the markets, these gains may be more than window-dressing. However, the planets tell us that if the underlying problems are not fixed, we are in for more hits. It is my expectation that it will take another round of direct government intervention to get the financial system back to some semblance of normal. I also expect the process of re-regulating and of truly investigating the naked short-selling crimes to become the primary focus of government by the fall, when the next Saturn-Uranus contact occurs (September 15). This will start the final round of Saturn-Uranus experience, giving us the opportunity to rectify the system as best we can see how. It is hard to envision what will come after summer of 2010, when the final Saturn-Uranus opposition occurs. Uranus heads on to square Pluto, and this is the biggest challenge yet. We have a chance to get it right and dull the force of this momentous energy. At its best, we will be well launched into our green economy and seeing ever more ways to dampen our effects on the planet. We will have ameliorated the situation of those in the worst poverty and the most peril, so that when peaks of conflict and climatic extremes occur they will not be so dramatic. It is possible to uproot the worst of these challenges, and in many ways President Obama is approaching them wisely, at least in the arena of foreign relations. Where the economy is concerned, in my opinion our leaders are on a steep learning curve. The financial systems as they currently exist defy the understanding of the most brilliant mind. This is, I believe, why the SEC hasn’t made any successful investigation of naked short-selling and related fraudulent trades; Chris Cox and his employees did not understand them. It remains to be seen if Obama’s SEC will do any better, or if we need a new regulatory body to manage the situation. Incredible as it may seem, we matter. If we don’t become educated and speak out, the only advisors Congress and the Obama Administration will be able to listen to are the Lords of the Universe themselves. We don’t want these foxes guarding our henhouse. How Long Do We Have Now? We’ve probably got until June 2010 before the economic system will be subjected to any more events that will change the landscape, the game, and the rules substantially. At that time, there will be a palpable change in perspective and priority as three major planets enter cardinal signs: Jupiter, Uranus, and Saturn (in that order). (The cardinal signs are Aries, Cancer, Libra, Capricorn.) We’ll make another shift in course based on conditions as they exist then. So, we can manage it, because we don’t have to take it all on at once. There are many doorways between now and then through which we can pass to make the situation better. The more enlightened we are about the time structure established by the planetary cycles and the human behaviors that correlate with them, the more prepared we will be to handle our experiences as they arise and make wise decisions to gain from them. We have the chance now more than ever to create a truly balanced and humane world. When we find ourselves in these circumstances, the first thing the I Ching advises is to reframe what is really going on: These surface appearances are signs that deep change is afoot, and that these are times of great opportunity — this is what great opportunity looks like. The next millionaires are created in an economic downturn. Even if you’re not the millionaire type, we each have the chance to reshape our lives more easily and build a more robust foundation because of the forces that are unleashed. The power that has been held in lockdown for years — in the financial empires, in the halls of government — is suddenly available to us. We can use it to start a new business or transform an existing one; to join a political movement that suddenly has a voice; to volunteer in creating social reform; and to carve our own unique path of meaning. The cover story in last week’s Newsweek was “Obama’s Nobel Headache”. In it, Evan Thomas lays out the facts to a mystery I’ve been pondering since Obama started putting together his economic team: Where’s Paul Krugman? Right before Obama named his team, Paul Krugman became an even more glittering star in the living economic pantheon by being given the Nobel Memorial Prize in Economics “for his analysis of trade patterns and location of economic activity”. He is also a professor in Economics at Princeton and the London School of Economics, and a member of the Group of Thirty international economic body as well as the Council on Foreign Relations. He writes regular op-ed pieces for the New York Times in his column revealingly called “Conscience of a Liberal” (title perhaps inspired by a book by the late Paul Wellstone). He has shown special fascination for and understanding of macroeconomics, especially international trade and finance and “economic geography”. His economic ideology is of the “European social democrat” ilk. He decries the growing gap between rich and poor and feels greed needs to be held in check — hence is pro-regulation. He is also outspoken and prefers being an outsider, according to Thomas. His op-ed pieces have carried more than a few draconian pronouncements, like the one on March 23, 2009 (when Treasury Secretary Tim Geithner spelled out the details of his bank-rescue plan). He called the plan “cash for trash” and said it “filled him with a sense of despair”. His preferred plan: The government must quickly act to nationalize the big, “zombie” banks (to stop the bleeding through bonuses and other self-interested actions) and guarantee the liabilities of all the nation’s banks. The lack of funding of the current plan will lead to a downturn like Japan’s “lost decade”, which started in the 1990s. What Is It with Paul Krugman, and Why Is He Saying These Terrible Things about Us? Well, now I know that Krugman disagrees with Obama’s guys (but is probably more aligned with Christina Romer), but why is he on the outside? What does he think is going on? What makes him tick? To go a little deeper into the mystery, the wise astrologer uses the tools of her trade. We have an untimed birth chart for Mr. Krugman, shown above. Even without the birth time, which gives us the location of the planets around the wheel and the degree of the Moon, we can see a great deal about a person. The resulting solar chart shows that Krugman was born a Pisces with a Virgo Full Moon. The Pisces is evident in descriptions of him. Evan Thomas describes Krugman as shy, sweet, not a prima donna, wears his fame lightly, gentle, a little absent-minded, and adaptive. These are all Pisces traits, when Pisces is not masked by a stronger energy. A mentor, Robert Solow, describes him as “very unassertive, mild mannered” as a grad student. His demeanor in public appearances is humble and unassuming. When he won his Nobel Prize, he was not out there blowing his horn. It was another day in the life, despite it being the accomplishment of a major goal for him. The Virgo Moon comes out as “nervous[ness]” and nerdiness and contributes to his reputation for gentility, lack of hauteur, and adaptiveness. Being an academic is second nature to this Moon. What may go unnoticed with these placements, however, is the quality of the Full Moon: It has “crisis consciousness” in two forms. First, it can adapt to and deal with crisis when it actually arises. Second and less favorably, it can see crisis in everything that moves. Pisces-Virgo does not describe the whole man. No description of Paul Krugman would be complete without noting his strong Aries streak, a part of him which is well known to colleagues, friends, and probably his wife. It certainly comes out in the more strident tones of his op-ed pieces and his sometimes need to dial back on the rhetoric. Does it surprise you then that he has Mars in Aries? This powerful rulership placement overpowers nearby Venus in Aries (her detriment), while the two oppose his early-fifties trademark Saturn-Neptune conjunction. This is both complex and deep, speaking to what drives him and his sense of purpose in life. One thing for sure, whatever Saturn-Neptune represents, he is driven to express it, or express against it. He is likely to be “anti” about the things he's interested in. This is even more the case when the universe throws in Uranus in Cancer and Chiron in Capricorn. The resulting cardinal grand cross gives us a revolutionary, or as he describes himself, “anti-establishment”, made quiet by Pisces-Virgo. For those born in 1952-53, Saturn and Neptune were conjunct each other, and all those born in this age group share a common awareness and related purposes. At its core, on a social level Saturn-Neptune is about how wed we are to consensus reality, that dream that we all dream together. This dream plays a huge role in an economy. We learn that money has value, so it has value. If we were to lose our faith in money, that a particular currency (or even money in general) faithfully represents our goods or efforts, the currency stops working. If we lose our trust that a system will reward us fairly for our goods or efforts, or that it will protect us against harm to their value, the whole system falls apart. Krugman carries this seed forward with his attunement to the economy and humanity's macro trends and systems. One good thing about Krugman is that, with so many planets in cardinal signs, he can pioneer new concepts. He can create the future. He is uniquely equipped for this when we add the visionary qualities of Pisces and the pragmatism of Virgo. You see, it takes courage, knowledge, wisdom, and vision to see the future, not the least because what we see is what we create. Although Paul Krugman may be glum about how Obama’s administration is handling the economic crisis, I keep asking myself, “And this is bad because . . .”. Krugman does suggest that substantive changes will take place in the world economy, changes that he still couches in terms of the old reality. However, he does have a vision of a better future, where the distance between rich and poor is flattened, greed is curbed through regulation, and where it is possible to do good and still succeed. In a fascinating report on Monday, “Economic Downturn Signals a New Normal”, Robert Siegel ponders the question of what will become the new normal once the new economic reality becomes established, whatever that is. He asks, “How will the recession change our country in the long term?” “They change us in ways we can hardly imagine,” says historian David Kennedy. Some of the suggestions: less credit, more saving; less home-buying, more renting; less spent on possessions, more on experiences; changes in what is considered a luxury experience or item; a smaller role for the U.S. Krugman would surely sign up for some of these possibilities if he weren’t so busy still trying to give voice to a better path to them. Why Doesn’t Obama Listen to Krugman? President Obama, for all his strengths, is human. He has been known to defer to his advisors, especially in areas of great complexity or where he is less well-informed, such as the economy (the former) or military policy (the latter). Obama’s advisors may be telling him that Krugman’s position is too extreme; Krugman feels that Geithner is too close to the crisis, including the people who created it, and has adopted too much of the investment banker mindset. He feels that Larry Summers has more resiliency in seeing through their foibles, and he hasn’t yet given up on the administration to move closer to his idea of what will work. But with Obama’s Saturn directly square to Krugman’s, Obama is at once too pragmatic for Krugman; and with Obama’s Pluto on Krugman’s Moon, Obama is the wrong kind of pragmatic for Krugman. In fact, with Krugman’s Pisces-Virgo approach to life, he could be called the Idealistic Pragmatist. And if he didn’t have such romantic notions of being the nerd who saved civilization (born of reading Asimov’s Foundation series in his youth), he might be willing to compromise more on his viewpoints — but would it help us if we didn’t have the caped economic crusader speaking for the poor masses huddled at the door of the big banks? Obama may end up listening to Krugman. He and Larry Summers stay in touch and share a mutual respect. However, it will go through the Summers filter. If Summers buys it, it will be transmitted and perhaps used. Summers is an idealistic Sagittarius who has more astrological connections with Obama, especially ones that give him that father-figure feel (Summers’s Saturn on Obama’s absent-father Neptune). More troubling is the fact that Obama’s economic team is decidedly old school, with the exception of Christina Romer. While this is a cause for concern in my opinion, it doesn’t trouble me as deeply as it would if this were still the case at this time next year. We are still in the first half of the Saturn-Uranus opposition period. Because they interact over two yearly planetary cycles, there is a two-step process in “getting it right”. This pair is heavily implicated in the economic crisis we are now experiencing (but are not the only culprits). By the fall, it will become apparent that the administration’s approach will need adjustments. Obama and Summers (with the help of past Fed Chair and elder economist Paul Volcker) may find their way to a more Krugman-like direction. What is now considered slightly lunatic fringe may become the new mainstream. If you think Krugman is a lone voice in the wilderness, think again. There’s William Greider, Robert Kuttner, Dean Baker, Robert Reich, and Nouriel Roubini, to name a few of those who speak with a similar voice. Once we see what type of regulation policy the Obama Administration embraces, we’ll know how contented this bunch will be. Regulation is likely to be the strongest feature of Saturn-Uranus Phase II. For now, patience, optimism, creativity, and informed activism are our best economic policies. I’m not sure that we can or should save the banks, myself. However, that’s the path we’re on, and if we’re going to do it, we should do it right. On Tuesday, President Obama embarked on his first international trip as leader of the free world. His eight-day, five-country itinerary includes visits to the UK for the G-20 meeting, followed by stops in France, Germany, the Czech Republic, and Turkey. His first visit abroad brings to mind the larger question of international relations with Obama at the helm. With the capable Secretary Hillary Clinton at the helm of the State Department, we can expect foreign relations to be better than under George W. Bush. However, there is much that can be pinned on Obama because he has the ultimate leadership role. What kind of relations can we expect while he is president? What countries might be his special strengths? Where might he have difficulties unique to him? There are several ways to assess this astrologically, but one of the most elegant is accomplished using an astro-locality map, like the one cast for his chart, show and linked in larger format above. Although we can look for specific planets that typically indicate difficulties, I think it is most useful to look at what planets are difficult for Mr. Obama to manage in his own life. These planets, when they are associated with a particular locality, may be projected onto his experience of the locality and be associated with difficult relations. Conversely, planets he uses well will be associated with positive foreign ties. 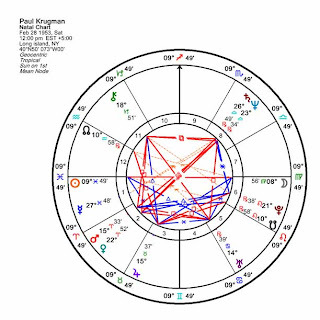 The good news is that Obama has focused a lot of energy on self-actualization, and he uses most of the planets in his chart very well. The planets he has the most difficulty with are Mercury and Neptune (which squares his Sun and Mercury). 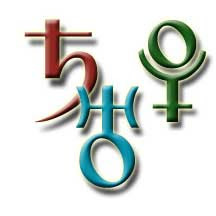 Mercury is unaspected except for its square to Neptune, and in Leo it can be less than objective. Jupiter also ties into this and, in my opinion, provides balance and objectivity, since Jupiter is in Aquarius. We will also look at Chiron and Pluto, which are opposed to each other. Typically, these planets represent challenges. He uses them most in his relationship with his wife, where he’s had the opportunity to develop a give-and-take balance of power. She is famous for bringing him back to reality when he gets a little too aristocratic or pedantic (a little too much Leo). The planets he uses well include, of course, his Sun in Leo, Jupiter, Saturn, Venus, and his Moon. Mars, the planet of war, is often one to watch. His Mars in Virgo is more oriented toward work than war. He’ll try to work things out, develop “working” relationships. It’s part of his pragmatic side, and it trines his Saturn very nicely. While conventional wisdom would suggest that this is a planet to watch, I do not agree. I think that if Obama goes to war, it will be because he is swayed by others (Mercury square Neptune) rather than making such a decision on his own steam. While he has many other checks and balances in his chart to make this a manageable factor, it is one to watch nonetheless. Mexico, Central America, and South America show up with both difficult and supportive planets. Mars, which is not particularly warlike in Obama’s nature/chart, is still worth watching. It most notably passes through Japan, Indonesia, Saudi Arabia, Iraq, Iran, Moscow (Russia), and Brazil. There is no doubt that Iraq currently requires the more military side of Mars, but Mars in Virgo is thoroughly constructive, not destructive. Obama’s Mars efforts are more likely to be directed toward community-building, both locally and internationally. There are some obvious international hotspots that are missing from the list: Israel, Lebanon, Syria, the Palestinian territories, Pakistan, Afghanistan. This suggests that relations can be generally improved in these areas and that they will not need to receive as much focus as expected. I do not want to sidestep the obvious deep and difficult issues with Pakistan and Afghanistan; only that this perspective suggests that these countries may not be as important over the course of Obama’s presidency as it now appears. Perhaps diplomacy will win the day! In general, because Obama is a more able leader and uses his planets with more understanding than our previous president, we can expect to see international relations improve dramatically, not just between the US and the other nations, but among the other nations as well. Tensions will drop as a leader takes the podium who has the ability to eloquently frame the issues in a positive and perceptive manner. Even though Obama has his weaknesses, his strengths are notable. It is possible to talk about world peace again as a viable reality.